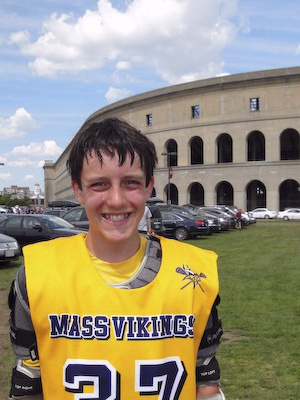 Before the Algonquin boys lacrosse team took the field in their season opener against Groton Dunstable at 9-11 Memorial Field yesterday, they dedicated their season to Trottier seventh grader Eric Green who passed away unexpectedly earlier this year. Green loved the sport of lacrosse, and many of the Algonquin players came up through the same leagues Eric was part of when he died. Wearing green shoelaces on their cleats, Algonquin soundly beat Groton-Dunstable by a score of 10-3. The team is looking to repeat the success of last year when they went undefeated during the regular season, making it all the way to the state finals before losing to Medfield.